I am pleased to be able to share this brief document – Enabling Participation which provides practical information around creating safe and inclusive spaces for young people to participate in the design of new health interventions. 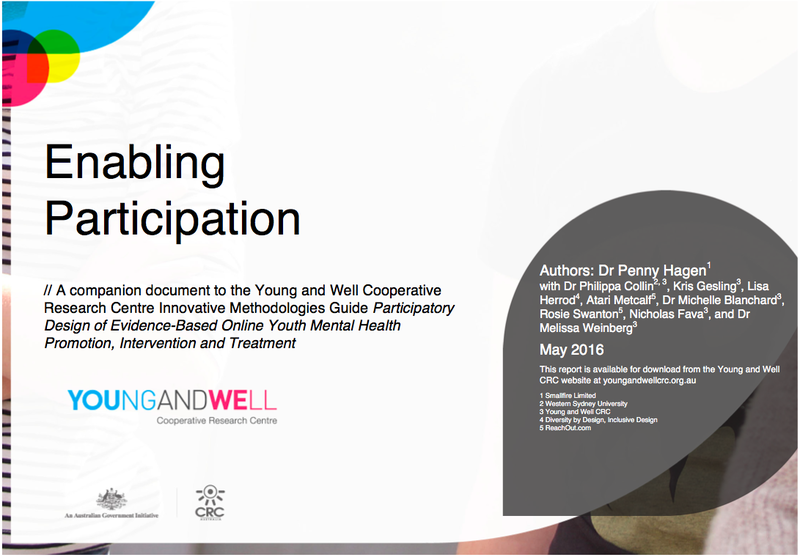 Enabling Participation was developed as a companion document to the Young and Well CRC’s first Innovative Methods guide Participatory Design of Evidence-Based Online Youth Mental Health Promotion, Intervention and Treatment [pdf], but has until now not been publicly available. Inclusive Spaces and ways to create environments that enable participation by young people of all different backgrounds and abilities. There are also a bunch of great resources in the back. While it is Australian based, there are still some practical aspects relevant to work in Aotearoa – (and it would be great to develop a local version with greater attention to culture and tikanga). It was a real privilege to collaborate with Dr Pip Collins, Kris Gesling, Lisa Herrod, Atari Metcalf and Dr Michelle Blanchard on the first version of this document, and huge thanks to Rosie Swanton, Nicholas Fava and Dr Melissa Weinberg who helped to develop it and get out this final version we are sharing now. Although the Young and Well CRC was wound down in June of this year, you can still access most of the research papers here on the Western Sydney University website.